This would be a great start to a lot more such sets. Quick: Name a female scientist. Can you think of one? Folks reading my blog are probably more bent toward science, so I suspect the odds are better than if you ask that same question of the public. It’s been done, many times, and most people come up with Marie Curie. If you ask them to name a living female scientist, they come up empty. That needs to change. Women have made a huge contribution to science, and the way we marginalize them is atrocious. That’s why MIT news editor and science writer Maia Weinstock proposed the creation of a female scientist Lego minifigure set. The set would feature notable women: Margaret Hamilton, Katherine Johnson, Sally Ride, Nancy Grace Roman, and Mae Jemison, all of whom had critical roles at NASA. Minifigs like this are very popular, and could be a great gift for boys and girls. 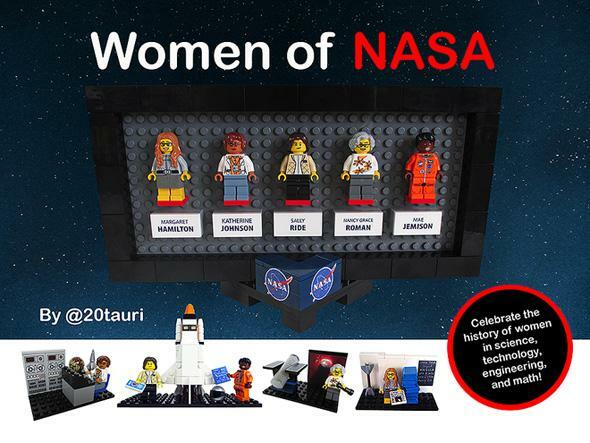 And it would raise awareness of these important role models in NASA history and in science; something I’m all for. This set does not yet exist; it’s been proposed and needs 10,000 supporters to go to the next step of being officially reviewed at Lego HQ. So sign up (it’s free) and give them a thumbs-up. It would be great to see this set get into the hands of thousands of kids (and, I’d wager, not a few adults) across the world. Thanks to my friend Bonnie Burton for letting me know about this. Go read her article about it, too!